Léon Samoilovitch Bakst (May 10, 1866 - December 28, 1924) was a Russian painter and scene and costume designer who revolutionized the arts in which he worked. Born as Lev (Leib) Rosenberg, he was also known as Leon (Lev) Nikolayevich Bakst (Леон (Лев) Николаевич Бакст). "Bakst" is his pseudonym derived from his grandmother's family name, Bakster (Baxter). All that time he lived in Europe because as a Jew in Imperial Russia, he did not have the right to live permanently outside the Pale of Settlement. Bakst came to prominence due to his involvement first with the World of Art group, which was edited by Sergei Diaghilev. Diaghilev would then become the founding director of the Ballet Russes and Bakst would become the design artist for the company, doing set and costume. Along the Marius Petipa as artistic director, their work would re-invigorate ballet in France with worldwide repercussions. Leon was born in Grodno (currently Belarus) into a middle-class Jewish family. After graduating from gymnasium, he studied in St. Petersburg Academy of Arts as a noncredit student, working part-time as a book illustrator. On his first exhibition (1889), he took the name of Bakst based on his maternal grandmother's family name Baxter. At the beginning of the 1890s, he exhibited his works with Society of watercolorists. During 1893-1897, he lived in Paris, where he studied at the Académie Julian while still visiting Saint Petersburg often. After the mid-1890s, he became a member of the circle of writers and artists formed by Sergei Diaghilev and Alexandre Benois, which later became the Mir Iskusstva art movement. In 1899, he co-founded, with Sergei Diaghilev, the influential periodical World of Art. His graphics for the World of Art magazine brought him international fame. Мир Искусства (Mir Iskusstva, or World of Art) was a Russian magazine and the artistic movement it inspired and embodied. The group helped revolutionize European art during the first decade of the twentieth century. From 1909, many of the miriskusniki (that is, members of the Mir Iskusstva movement) also contributed to the Ballets Russes company operating in Paris. Paradoxically, despite its influence, few Western Europeans actually saw issues of the magazine itself. The artistic group was founded in 1898, by a group of students that included Bakst as well as Alexandre Benois, Konstantin Somov, Dmitry Filosofov, and Eugene Lansere. The starting moments for the new artistic group was organization of the Exhibition of Russian and Finnish Artists in the Stieglitz Museum of Applied Arts in Saint-Petersburg. Bakst would also show his work in World of Art exhibitions, as well as the Munich Secession and exhibitions of the Union of Russian Artists, among others. The magazine was co-founded in 1899, in St. Petersburg by Bakst, Benois, and Sergei Diaghilev (the Chief Editor and director of the Ballet Russes). They aimed at assailing low artistic standards of the obsolescent Peredvizhniki school and promoting artistic individualism and other principles of Art Nouveau. "Members of the World of Art Movement," by Boris Kustodiev (1916-1920). Apart from three founding fathers, active members of the World of Art included Lansere, Mstislav Dobuzhinsky, and Konstantin Somov. Exhibitions organized by the World of Art attracted many illustrious painters from Russia and abroad, notably Mikhail Vrubel, Mikhail Nesterov, and Isaac Levitan. In its "classical period" (1898-1904) the art group organized six exhibitions: 1899 (International), 1900, 1901 (At the Imperial Academy of Arts, Saint Petersburg), 1902 (Moscow and Saint Petersburg), 1903, and 1906 (Saint Petersburg). Like the English pre-Raphaelites before them, Benois and his friends were disgusted with anti-aesthetic nature of modern industrial society and sought to consolidate all Neo-Romantic Russian artists under the banner of fighting Positivism in art. Ivan Bilibin's illustration to The Tale of the Golden Cockerel. Like the Romantics before them, the miriskusniki promoted understanding and conservation of the art of previous epochs, particularly traditional folk art and the eighteenth century rococo. Antoine Watteau was probably the single artist whom they admired the most. Such Revivalist projects were treated by the miriskusniki humorously, in a spirit of self-parody. They were fascinated with masks and marionettes, with carnaval and puppet theater, with dreams and fairy-tales. Everything grotesque and playful appealed to them more than the serious and emotional. Their favorite city was Venice, so much so that Diaghilev and Stravinsky selected it as the place of their burial. As for media, the miriskusniki preferred the light, airy effects of watercolor and gouache to full-scale oil paintings. Seeking to bring art into every house, they often designed interiors and books. 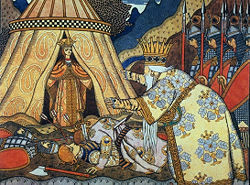 Bakst and Benois revolutionized theatrical design with their ground-breaking decor for Cléopâtre (1909), Carnaval (1910), Petrushka (1911), and L'après-midi d'un faune (1912). During the World of Art period, Bakst continued easel painting as well producing portraits of Filipp Malyavin (1899), Vasily Rozanov (1901), Andrei Bely (1905), Zinaida Gippius (1906). He also worked as an art teacher for children of Grand Duke Vladimir Alexandrovich. In 1902, he took a commission from Tsar Nicholas II to paint Meeting of Russian sailors in Paris. During the Russian Revolution of 1905 Bakst worked for magazines Zhupel, Adskaja Pochta, Satyricon, then for art magazine Apollon. Beginning in 1909 Bakst worked mostly as a stage-designer, designing sets for Greek tragedies, and, in 1908, made a name as the artistic director of the Ballet Russes under the direction of Sergei Diaghilev. The Ballets Russes was a established in 1909, residing first in Théâtre Mogador, Paris; and then in Monte Carlo. It sprang out of the Tsar's Imperial Ballet of St. Petersburg, from where all its dancers were associated and trained, under the influence of the great choreographer, Marius Petipa. It created a sensation in Western Europe, bringing the energy and vitality of Russian ballet, which was greater than that of France at the time. It became the most influential ballet company in twentieth century, and that influence, in one form or another, has lasted to this day. The company included the best young Russian dancers, among them Anna Pavlova and Vaslav Nijinsky; their first night on May 19, 1909, was a sensation. Among Bakst's great successes were (Cleopatra (1909), Scheherazade (1910), Carnaval (1910), Narcisse (1911), Le Spectre de la rose (1911), and Daphnis et Chloé (1912)). Together, the three luminaries of the Ballet Russes, Diaghilev, Petipa and Bakst, developed a more complicated form of ballet with show-elements intended to appeal to the general public, rather than solely the aristocracy. 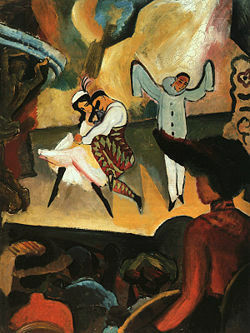 The exotic appeal of the Ballets Russes had an effect on Fauvist painters and the nascent Art Deco style. In addition to revolutionizing set design, Bakst was an art instructor as well. During his visits to Saint Petersburg he taught in Zvantseva's school. One of his students was Marc Chagall (1908-1910). In 1910, they had a falling out. Bakst advised Chagall not to go to Paris as, according to Bakst, it would be harmful for Chagall's art and would probably be financially ruinous as well. Chagall ignored Bakst's advice, moved there anyway, found his style, and became one of the most influential artists of the twentieth century, far outstripping Bakst. In 1914, Bakst was elected a member of the Imperial Academy of Arts. In 1922, he broke his relationship with Diaghilev and the Ballets Russes. He died in 1924, in Paris, from lung problems. Alexandre, Arsene. The Decorative Art of Leon Bakst. Dover Publications, 1972. ISBN 9780486228716. Chagall, Marc. My Life. St. Petersburg: Azbuka, 2000. ISBN 5-267-00200-3. Spencer, Charles. Leon Bakst. St. Martin's Press, 1973. ISBN 9780902620803. This page was last modified on 25 June 2018, at 21:54.